Recently, I started working on the water feature to my Test of Honour board and have been getting mixed results after the first few days. Admittedly, I knew I wasn’t “doing it right” from the get-go but decided to keep going regardless. 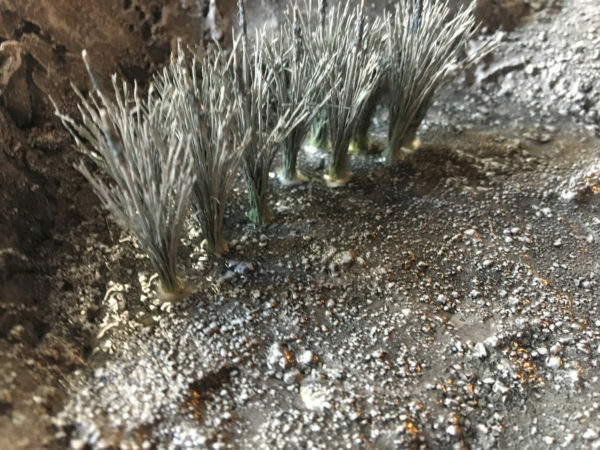 I’m using Woodland Scenics Realistic Water (which, contrary to my title, isn’t actually resin) and finding that it is an interesting, albeit fickle, product to work with. 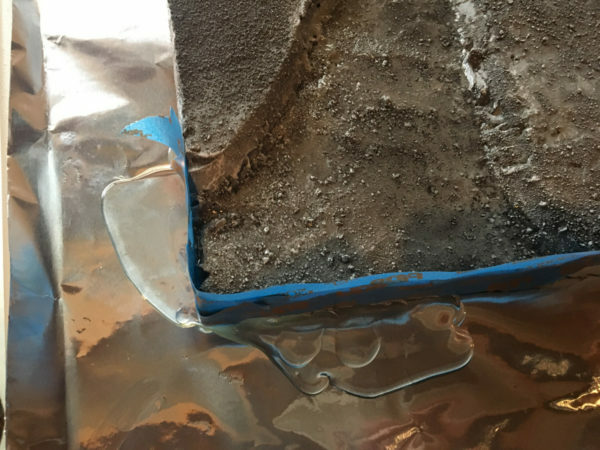 The directions for Realistic Water are pretty simple in that you pour a bit in your sealed and prepped area and let it dry for at least 24 hours. A big drawback is that you can only pour in 1/8th inch deep sessions. This makes the project time take forever if you are trying to do anything more than a little puddle. There are “deep pour” products out there as well but I’d already picked this product up so I decided to try it out. I knew right off the bat that I’d have some issues and didn’t have a solid plan to get around it but decided I’d wasted enough time. 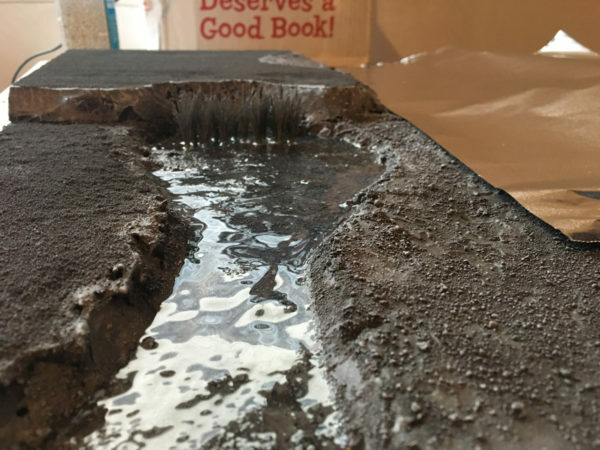 Issue #1: the end of my water feature was on a corner, not a straight side of the board. I didn’t have rig or corner piece to hold that in so I did probably the worst option available- painters tape. It did what you would expect- leak. 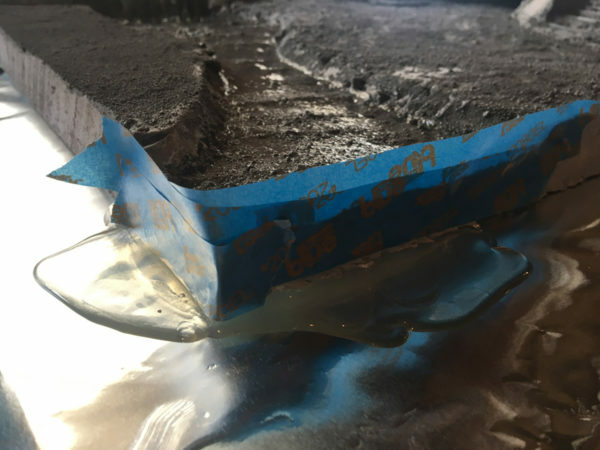 Here’s where that time-consuming 1/8th inch pour saved me as it leaked out and hardened (on a foil base- at least I thought that far ahead) but I didn’t lose an entire pour to the process. It did leak quite a bit by the time the 24 hours had passed. On the plus side though, the leak dammed up the shoddy tape job (I hoped) and I could pour again. 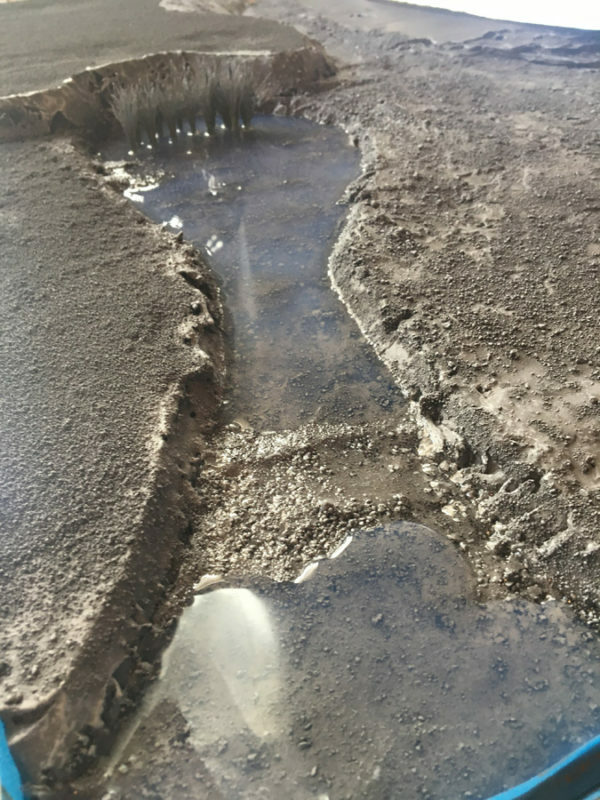 This was the leak footprint at the start of the second pour. And here we have after the second pour. Looked the same to me so if it leaked out, it wasn’t pooling here anymore. More “water” stayed in this time so I think with the inevitable shrinking and damming up more nooks/crannies, the water has created the seal I needed. looking at the other side of the model, we have the main part of the feature with the pond. 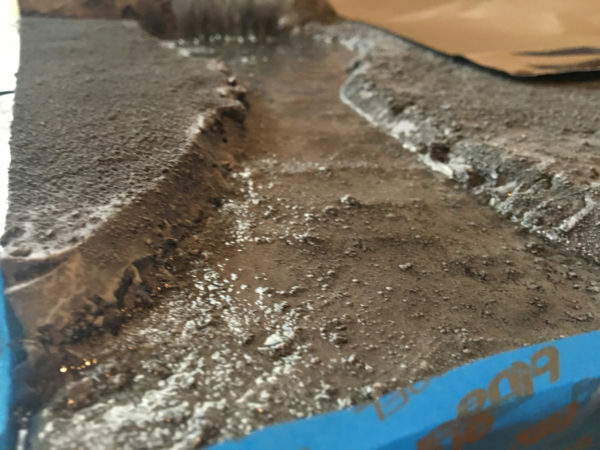 Due to the height differences in my river bed, a natural dam formed so that side of the pour could stabilize. It did bring up issue #2: gluing the cattails into the board. A thorough reading of the instructions would reveal a critical line about this product not playing well with PVA glue. Apparently, what that means is it breaks down the PVA and turns it all white. I guess it could be worse and it could have turned it orange but still it is not a desired effect. Since I have a few layers to go before I get my desired pour height, I think I can hide this by eventually adding some color to the water. Having it crystal clear is nice but I don’t think it will give the desired effect I’m going for so tinting was always going to be added but maybe I should have added it from the bottom and gone lighter on the way up. 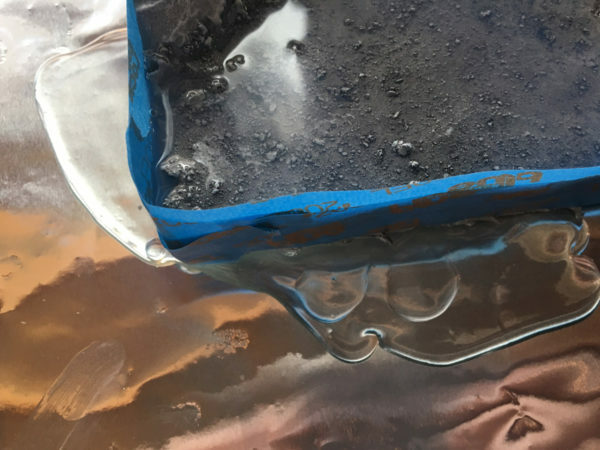 First, I’ll have to get these pours to stabilize to where I can pour the whole length at 1/8th inch so the bed can start looking like an actual river pond and less like a drying out drought bed. The pond side is definitely getting there but if the board-edge side doesn’t fully seal, the heights of the two will merge and keep flowing out of the model (maybe via a crack or hole I’m not seeing on the edge. I still have a good amount of the bottle left so until then, I’ll pour and wait. Pour and wait. 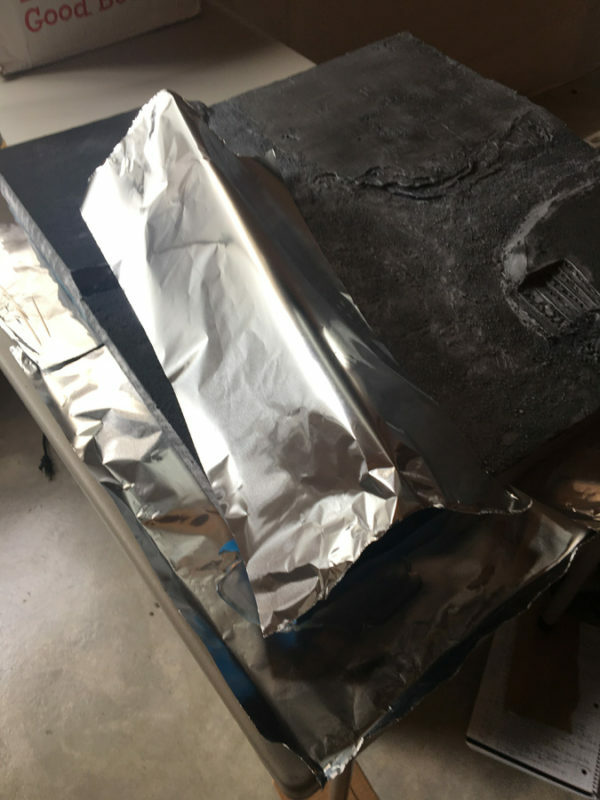 Oh and cover it over so debris doesn’t fall in and mar up the surface. Once I have a surface to care about. I think you’re seen Luke Towan’s videos on YouTube, but he adds (wood) glue to help seal the masking tape to keep the water from flowing out. Ah that is nice, I’ll check out his videos. 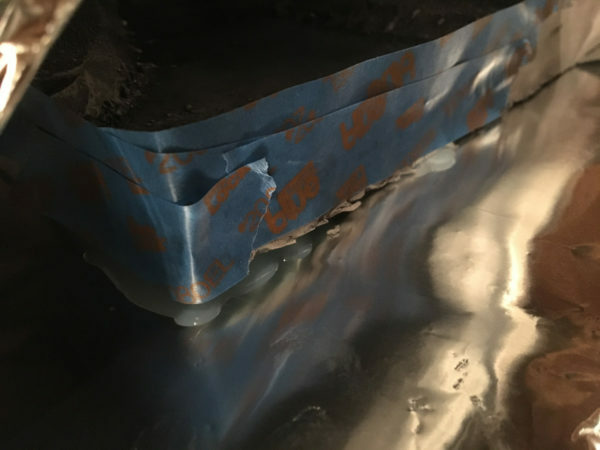 I was hesitant to use any glue or sealer as I didn’t know if it would come off or react but good to know about wood glue. Also cool on the airbrush + mod podge. I just took the jump into an airbrush (still haven’t set it up yet though). After letting my airbrush sit in the box on a shelf for months, I took a class from a local guy that paints mini and learned some of the basics, and the most important stuff he taught was some set-up/tweaking none of the YouTube videos I watched had (moisture trap on at the air intake on the brush, plus a quick release w/ pressure valve on the coupler has made life a lot easier – just mail me and I’ll send amazon links if you’re interested). I’m not at the point of “I can screw these things up on the way to learning and it’ll be ok”. That’s what 600+ Zombicide minis can be used for in a worse case scenario. And I’m overly wordy tonight. Alabama is about to get snowed in with potentially an inch of snow and we’re all freaking out. I totally feel like I could easily let my airbrush just sit in the box for months. I tend to do that with things. I’ll push to get it out sooner and luckily, I have a few friends with similar “rigs” so that should inspire me to move forward. It’s pretty dry out here but I’ve heard a moisture trap is a good investment so before I get things too setup, I’ll look into one of those as well- I think I saw them for pretty cheap. Sounds like the snowpocalypse got cancelled and even the local weather people issued apologies. I’d take an apology over crazy commuter traffic any day.